Helps you easily define the server connection a tab is currently related to by the matching color. With this functionality, you can simply assign a color to the environment for the servers related to development, production, sandbox or test. Additionally, it is possible to add or delete Color Match by clicking the corresponding buttons on the Settings section of the Options menu. The functionality monitors active open sessions, thus, allowing you to restore accidentally closed or unsaved tabs within the current IDE session. 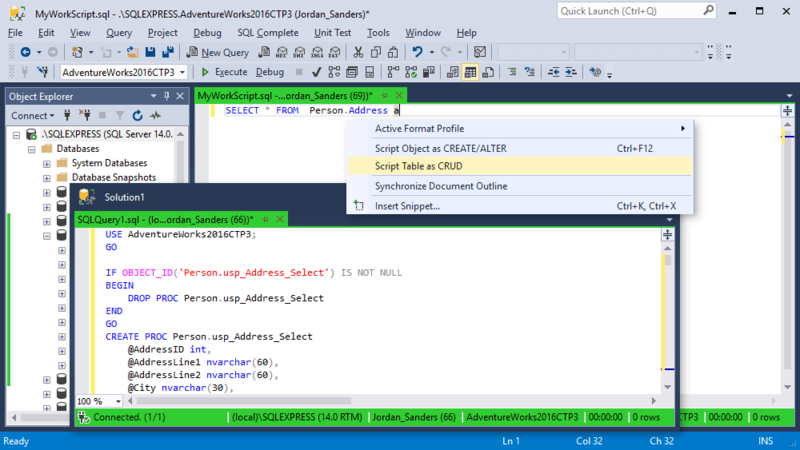 You can change or define your own naming pattern for the SSMS main window caption and SQL document tabs. This way a proportional tab width is achieved so that you can control what is displayed in the tab name. Easily opens recently closed tabs within one SSMS session, including the unsaved ones. Stores main information about executed SQL statements for a particular period. You can view, edit, and search the queries you run in the database. Additionally, you can monitor who executed a query and when, as well as other valuable information. Select databases on the current server and execute a script against them from one query window. You can also specify the mode, in which the script will be executed for the selected databases: parallel or sequential. It displays a current document structure and considerably simplifies navigation in large SQL documents. You can synchronize the structure with text directly from the code. You can execute a specific SQL statement without selecting it. You just need to place the mouse pointer over the statement and press Ctrl+Shift+E or Alt+Enter, and dbForge SQL Complete will define the statement boundaries itself. A handy feature allowing you to execute a script to the current position of the cursor. 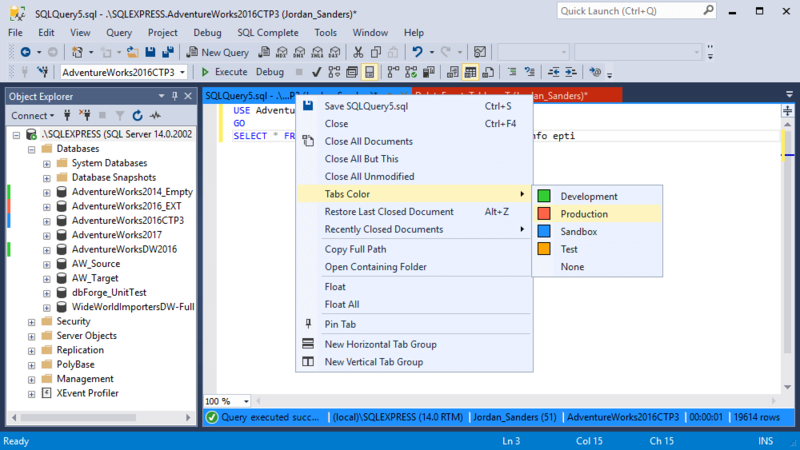 Navigate from Code Editor straight to a specific object in Object Explorer (Server Explorer in Visual Studio). dbForge SQL Complete easily handles encrypted objects, it shows the DDL of an encrypted object in a separate sql document. Find matching BEGIN/END pairs in complex queries. By pressing Tab, your cursor will jump up or down to the matching keywords. In large INSERT statements, it's often hard to determine which value corresponds to which column, and vice versa. This functionality will help you quickly locate a corresponding value for the current column. This option will come in handy when you need to generate CREATE/ALTER scripts for a large number of objects in a database. It allows you to script out all the object at once rather than repeating the same action multiple times. Quickly generate CRUD (CREATE, READ, UPDATE, DELETE) stored procedures for tables using customizable procedure that can be changed to better suit your needs. 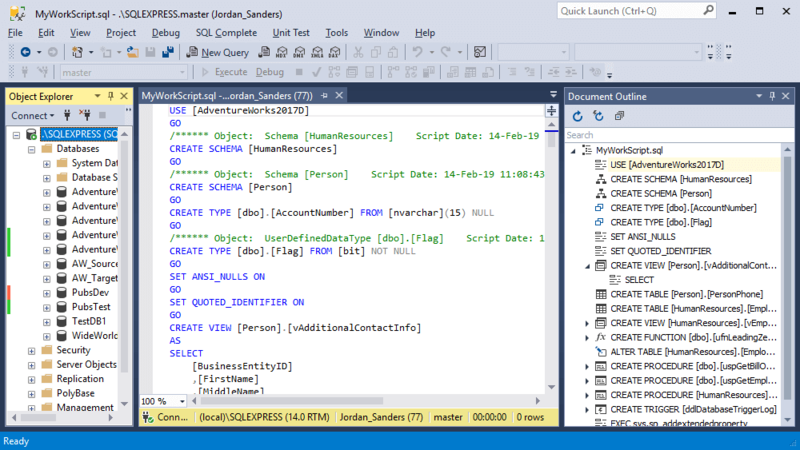 Unwraps the sp_executesql procedure into a neat and readable static SQL query. 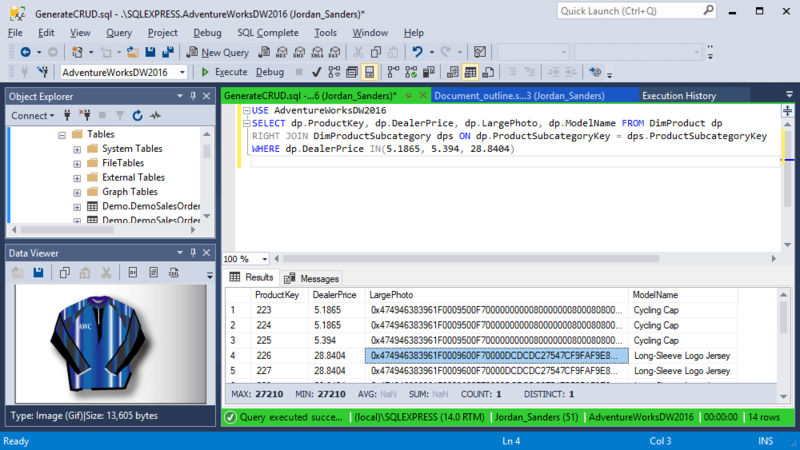 This feature allows to simplify debugging by replacing the call to a stored procedure with the stored procedure body. 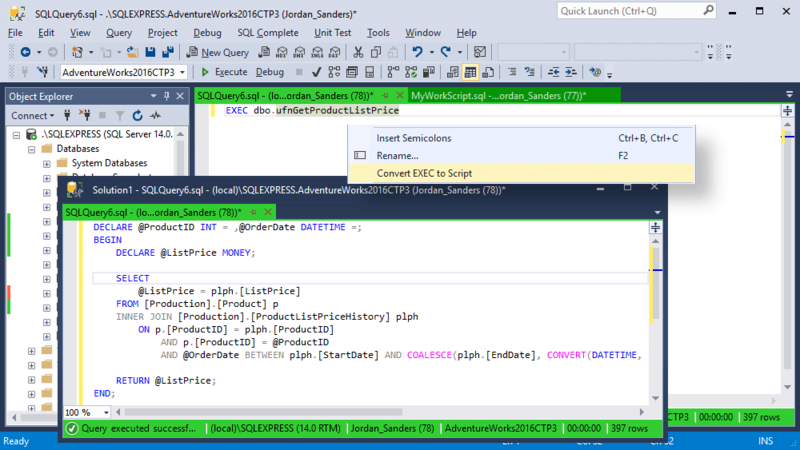 It takes the contents of the stored procedure and replaces the call in your query with them. This feature analyzes the script executed in the DELETE, DROP, TRUNCATE, and UPDATE statements and generates a blocking message depending on the environment or certain restrictions. For example, the message will be prompted is you try to execute a DELETE statement against a production database. When a query is successfully executed, a pop-up dialog box notifies you about the time of execution. If the query was running more than 23:59:59 hours, days are added to the time in the Execution Notification. Whenever there open transactions during query execution, a reminder will pop-up informing you about the number of uncomitted transactions. 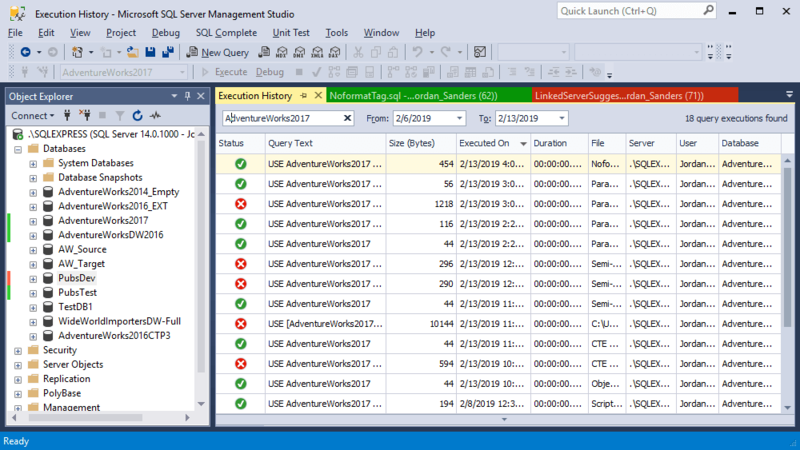 Generate a script from SSMS grid based on the data in the table for the following statements: INSERT, INSERT #tmpTable, WHERE IN(), WHERE AND OR, UPDATE. The result statements will be scripted to a new temporary table. The data from a cell or entire table can be copied from the results grid to a file or clipboard in any of the available formats (CSV, XML, HTML, JSON). Automatically displays calculations on the SSMS status bar after selecting two or more rows. To calculate aggregates, select a range of values in the Results Grid. You will see MAX, MIN, AVG, SUM, COUNT, DISTINCTON for these values on the status bar. In the results grid, data in Hexadecimal, Text, XML, HTML, Rich Text, PDF, JSON, Image, Spatial formats may be visually represented via the Data Viewer window. Searches all the matching data in the grid by the specified value. Extend the search by adding the following search details: Match Case to set a case-sensitive search Whole Words to look for the single words Use Regular Expressions to set the search by Reg Exp Close button to close the search bar All the data found will be highlighted in the Results Grid.